Now that Christmas is over I’m attempting to wean myself from so many peppermint pastries. It was good while it lasted (Sooooo good) but moving onto New Years celebrations. 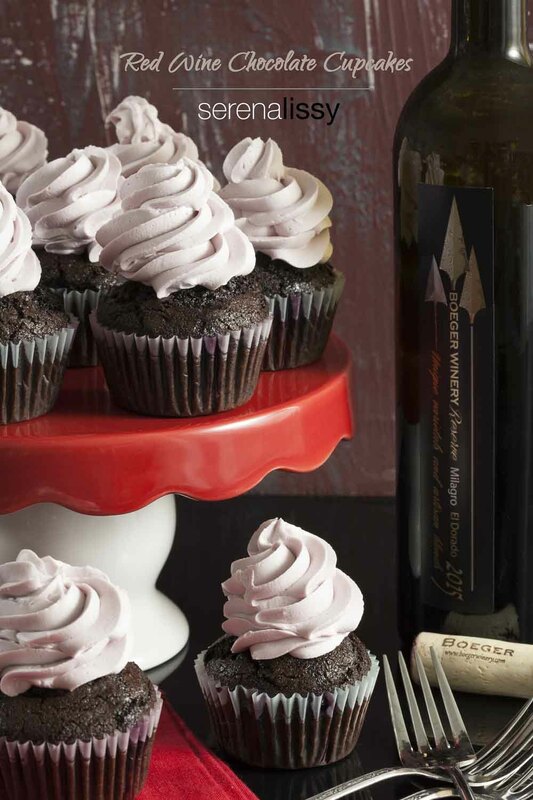 These red wine chocolate cupcakes are just the thing I need for my New Years Eve party. It’s been years since I’ve gone out on the town for New Years. I just can’t make myself fight the crowds and pay the inflated prices for every venue in the city. A small get together at the house is much more my speed lately. You know what I’m talking about. A few close friends, a few great bottles of wine or bubbly, some awesome appetizers, the NY times square ball drop in the background on the TV, all paired with some gourmet chocolate cupcakes. I was up in Northern California for a conference a while back and we went on a wine tour. I loved this wine from Boeger winery up in Eldorado County. As many times as I have been wine tasting in California I had never ventured to El Dorado County. It was a diverse place with stunning beauty. There was a great blend of gorgeous scenery, colorful history, and fun outdoor adventures. You can get the wine from the winemaker, or if you have your own favorite go ahead and use it. It made a great addition to the cupcake. I used it to create a wine syrup reduction and mix with the buttercream to give the frosting just a tiny bit of wine deliciousness. Now if you think you just want to go with plain buttercream, you don’t need to add the wine. But if you like the color just add a few drops of gel food coloring to get the red frosting. For this recipe I used the red wine reduction in the batter while baking and I also used it once done baking. Once the cupcake was cooled I took a wooden skewer and poked a few holes in the top of the cupcake. I then drizzled some of the wine reduction into the holes and let the cupcake soak it up. Just a tiny bit here. A little goes a long way. You could skip this part if you wanted. It depends on how much red wine flavor you like. If you try one and decide you would like a bit more red wine flavor, go ahead and add. If you like it just the way it is, then call it done. Frost the cupcakes and enjoy! As always we hope you enjoy them as much as we do. Please share if you end up making them, we always love to hear how it goes. If you find you are still longing for the peppermint like I am, these little chocolate peppermint meringues make great party food or even peppermint bark. Cheers to a Happy New Year! Line your cupcake pan with 24 pan liners. Sift flour, sugar, cocoa powder, salt, baking soda and buttermilk powder into mixing bowl of stand mixer. With paddle attachment mix on low speed to combine. Add oil, water, eggs, and 1/4 cup wine syrup one at a time and continue mixing until blended together. Pour into cupcake pan and bake for 16 - 20 minutes or until cake springs back when lightly touched or toothpick inserted into center comes out clean. If you want more wine flavor, use a skewer and poke holes in top of cupcakes, use 1/8 cup of wine syrup and drizzle over tops of cupcake. In the bowl of a stand mixer with paddle attachment, beat together the confectioners sugar, butter, milk and vanilla on low speed until combined. Stop the mixer and scrape the sides down. This will make 2 cups frosting. Yes please! I have never had cupcakes like this before, but I want to make them for New Year’s Eve! OMG! These sound simply amazing!! I would have never thought to add red wine to cupcakes!! AMAZING!! Such a smart idea to use red wine as we know how beautifully it pairs with chocolate. Increase the water to 525 grams and eliminate the wine for just a chocolate cupcake. Sound like the perfect dessert for our new years bash! 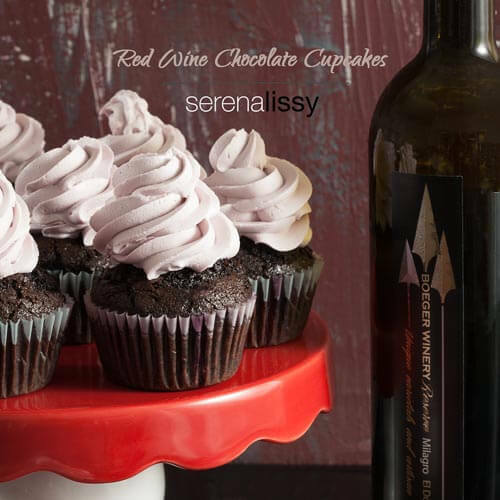 Oh I’ve never heard of red wine in cupcakes… sounds so delicious. I love alcohol in my bakes so this is definitely a must try. Oh those really look GOOD! I’ll have to convert your measurements to cups and teaspoons, etc. Now, to find red wine syrup! These cupcakes are the bomb, I would love to give the recipe a try! Thanks for the tips on how to make it perfect! My best friend makes something like this for our girl’s nights. They’re amazing. Great idea for New Years Eve! I don’t know why I haven’t been making these for those kind of events. Definitely in 2018! This is a great yet simple to make recipe. I would definitely share this and will try to bake one of these days. Great recipe, thanks for sharing! Whenever I am feeling lazy and make brownies from a box, I love to sub in red wine for water, it really adds a wonderful richness to an otherwise boring dessert. I haven’t tried the brownies with wine. It’s on my list of tests to do. Glad to hear that the flavor is good. Oooooh these look amazing! I have try them, and love that my husband will also enjoy them. He loves red velvet and I love wine! Seriously? You said the two magic words.Wine and cupcakes…how can you go wrong? !I have never heard of it going together in a recipe like this but trust me, I am NOT complaining! Red wine cupcakes?! OMG, where have you been all my life? I will definitely need to try these out. Thanks so much for the thorough instructions. I remember trying an adult cupcake at a bakery a few years ago. They were all infused with some type of liquor and they were insanely delicious. Using red wine in the frosting sounds amazing. Can’t wait to try these out, maybe over NYE. These look so delicious! I LOVE chocolate, and cupcakes, these look like great dessert items for a girl’s night. Oh wow, I wouldn’t have though about making cupcakes with wine and combine it with chocolate. Yummy. two of my favorite things, wine and chocolate, how can you go wrong!? I totally have to try these out soon! I love wine and cupcakes the same. This recipe which combines both, sounds just amazing. I am pinning it for later, so delicious. I won’t be able to make it. But I sure want to eat it. These look super fun to make as we do have some leftover red wine which I’ve been thinking where to use. I love the frosting on these too. Wow, these look wonderful and would be so great for many of my friends. Definitely an awesome party food! These cupcakes look so delicious! I really need to try this recipe, although they probably won’t turn out as pretty as these! Thank you for sharing this wonderful recipe! These look so yummy!! I’d definitely skip the red wine part for myself, LOL, but these look fantastic!! OMG! These look soooooooooo decadent and elegant. These would be perfect for Valentine’s Day! What a treat!